I used to smoke, but during my three pregnancies I chose to stop smoking from the time I found out I was pregnant. That choice eventually lead to quitting the habit all together, something women trying to conceive may want to try before getting pregnant. Researchers have found a connection between ectopic pregnancy and smoking, a connection that may literally prevent a woman from ever having children at all. Ectopic pregnancy is when the fertilized egg implants in the fallopian tube. The egg starts to grow and eventually places so much pressure on the tube that pain begins. The pain often grows worse and if left untreated, the pregnancy can lead to permanent damage to the fallopian tube, internal bleeding and death. What does smoking have to do with ectopic pregnancy? Researchers broke down nicotine into another substance called cotinine. Cotinine affects the production and expression of the BAD gene – a fallopian tube gene. Less BAD equates to increased risk of ectopic pregnancy. 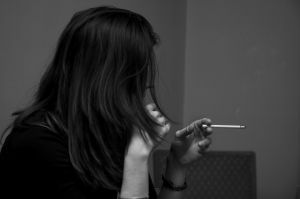 BAD is lower in women who smoke – thus the connection between smoking and ectopic pregnancy. What can women do to lower risk? The plain and simple solution is to stop smoking. The effect of smoking on the BAD gene could take some time to reverse, so stopping right now is the best choice. Ask your gynecologist about smoking cessation programs. If you are currently pregnant and smoking, ectopic pregnancy may not be a concern, but there are many complications – both pregnancy and birth-related, connected to smoking while pregnant. Pregnant women can stop smoking as well and stopping at any time during pregnancy will reduce the risk of some complications. Stop smoking today and reduce your risk of ectopic pregnancy, pregnancy complications and birth defects. Source: European Society of Human Reproduction and Embryology. July 4, 2012.